Today online stores are strengthening their efforts to improve brand's awareness. You may find dozen ways how to build a mutually beneficial relationship with your customers. One of these ways is providing your customers with earning points for purchases that can rise social activity up to 30%. It's possible with the Customer Balance & Rewards System extension for Magento. There are 3 ways that can help to stimulate customer loyalty. Your online store may provide credits or money and points that can be used for new purchases or service. As points can be provided for “purchase-associated” activity - registration, reviews writing, visiting the website, customers can visit your store more often that stimulates their interest and purchases as well. Customers purchase products and receive points for the orders that can be redeemed for future orders. Thus it may encourage them to earn enough points and buy more. Points can be provided for referrals, there is ability to share balance with friends. This is a source of new leads for your store from your current customers. You want to attract more customers to a store, you need to stimulate them to visit it. Set different reward rules, enhance social activity, offer points for future purchases in the store. Your customers will be able to convert points into real money, share them with friends, and earn points for website activity and big purchases. 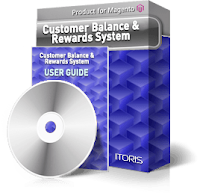 Check out the full article about the Magento Customer Balance & Rewards System extension.